A marathon negotiating session that lasted more than 16 hours, stretching from Saturday afternoon until just before dawn Sunday, produced a 10-year deal that still must be ratified by the players. After the sides stayed mostly apart for two days, following late-night talks that turned sour, federal mediator Scot Beckenbaugh worked virtually around the clock to get the sides back to the bargaining table. This time it worked - on the 113th day of the work stoppage. All games through January 14 had previously been canceled prior to the agreement, but play is slated to start soon after that date. The Denver Post writes, "An abbreviated season will begin, possibly as long as 52 games and no shorter than 48, some time between Jan. 15-20." Though not every KHL deal is the same, when Evgeni Malkin and Sergei Gonchar signed with Metallurg Magnitogorsk in September, the New York Times noted, "Both players can terminate their K.H.L. contracts and return to the N.H.L. if the lockout ends." It'll be a harried and confusing next week or two, with much travel and little time to prepare, but it seems like teams will have most of their rosters intact and play will start in time for a substantial chunk of the regular season to go on as if there were never any management shenanigans in the first place. The NBA went through similarly abbreviated season last year, so we know this: Expect a great deal of hand-wringing about the increased likelihood of injuries in the absence of a proper training camp, some talk of "asterisks" late in the schedule when play is sloppy, and for everyone to pretty much forget about the shortened regular season once the playoffs start. Yes, It&apos;s Almost Time For Hockey. 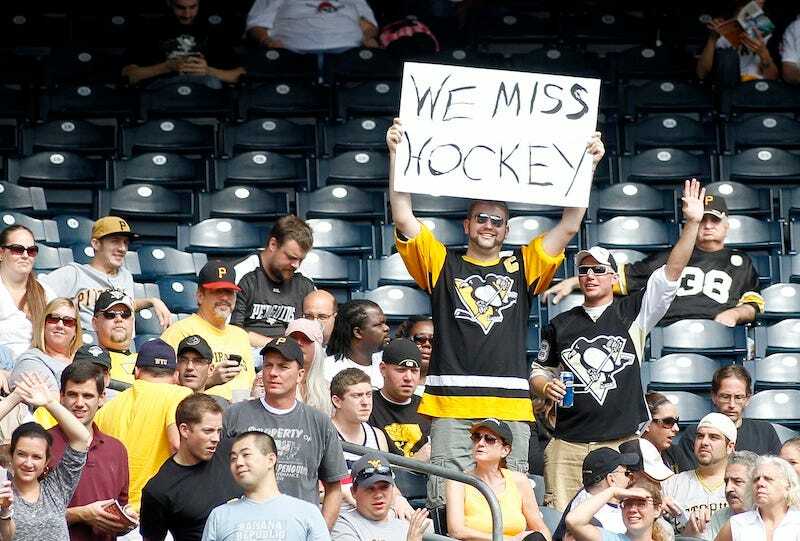 No, There&apos;s No Hockey. Deadspin Tries To Explain. Wait, did something happen to hockey? LeBrun also noted that a January 15 start date would indicate a 50-game season, while a January 19 start date would indicate a 48 game season. Some reporters are suggesting the former is more likely, some the latter.